After I posted last week’s video review of my first Stitch Fix box a ton of you inquired about the kimono top I was wearing in the video. Yes, I made it myself and was so glad to see how many of you were interested in learning how to make it. My friends at Fabric Mart Fabrics sent me some really pretty chiffon fabrics to play with so I created this video tutorial for you! The video covers step-by-step instructions and tips for working with chiffon. 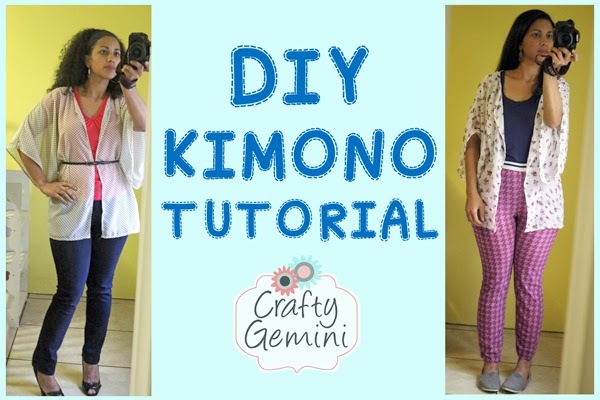 I also teach you how to make this kimono using french seams for a really professional finish on those inside seams. Don’t worry. You can do it! It sounds a lot more intimidating than it is… really. If you’ve never sewn with chiffon let this be your first project! When choosing your fabric for this type of project you want to make sure you get something light, airy, sheer and that drapes nicely. This will help add that flowy feel to the garment. Other chiffon fabrics that would work nicely for this kimono project can be found HERE. Now I’ll leave you with the video! Click here to watch the complete tutorial. Hi Vanessa…. how many yards you recommend to buy? LOVE, LOVE, LOVE THIS.Thank you. I am going to make one using cotton jersey. What a GREAT TUTORIAL, you ROCK! I love this tutorial. I’m going to make this for my daughter. I’m sure she’ll love it. Love it. How much yardage do you need? I love it and can actually see it a bit longer as a bathing suit cover, lounging around a pool or at the beach, ( not that I have either) but it has inspired me. I love this tutorial. I’m going to make several for the spring and summer. It’s a good top to wear over crops, pants and skirts. Thanks for sharing!